Good place to take a friend for a quiet drink. Although most come here to eat, the beer is decent and not too much seeing as they must have spent some money on keeping it well decorated and current. Formerly a Gordon Ramsay pub, now spruced up and reopened by Nick Gibson, who also owns the Drapers Arms in Islington. With former Le Caprice chef David Philpot in the kitchen, there's still an emphasis on high end food - which, judging from the many empty tables we saw on a Friday lunchtime - may well be lost on the residents of the shabby flats surrounding the pub. The decor is ruined by the hideous wallpaper, but what's definitely welcome is the choice of three fine cask ales, which included Woodeford's Wherry and Sambrook's Wandle. A pleasing alternative to the Fullers pubs which abound in this area. Went here expcting expensive restaurant food and was very surprised to find lots of very well priced British pub food. The biggest surprise of all was the good real ales and cheap cocktails. 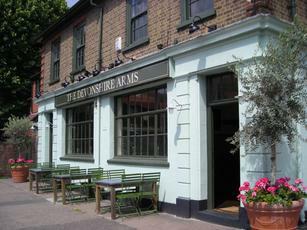 Having been to the Harwood arms and the Sands end I have to say that this is my favourite pub in London. Being a Gordon Ramsay pub restaurant, I was expecting a fancy overpriced gastro-pub. However, my pint was 'only' �3.30 and the small-ish bar area retains a reasonable pub feel with a selection of different furniture including a row of bar stools. The larger restaurant area also has some sofas at one end providing extra seating. London Pride, Old Hooky and Old Rosie cider on handpump. Better than I expected, but so quiet in mid-afternoon the barmaid spent the whole time pacing about in a rather disconcerting manner.